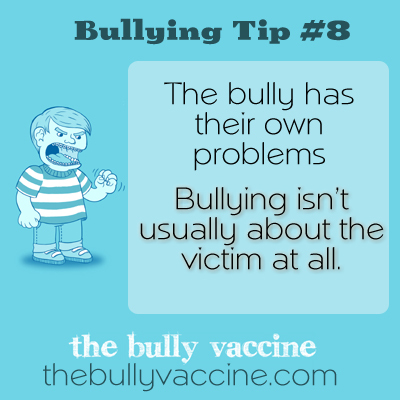 Bullying Tip #8: Bullying isn’t usually about the victim at all. If we want to stop a bully, we need to learn why a bully bullies in the first place. Bullying prevention often focuses on the victim when we should be focusing on why bullies bully in the first place. The bully has their own problems. Bullying isn’t usually about the victim at all. 8. Blog was helpful in saying that its not anything to do with the victims. Its the bully that’s got the problem.